So often, we see kids with weakness. 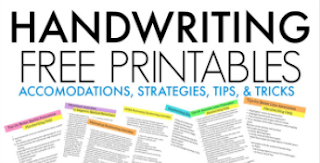 They struggle with climbing monkey bars, maintaining grasp on a pencil, coloring with endurance, maintaining posture with a strong core, manipulating snaps and buttons, and so much more. A consistent home strengthening program can help with these skills. A therapy band is such a power tool in providing needed and calming proprioceptive sensory input, too. Many times, therapists will add therapy band exercises to a sensory diet. There's a reason why! Slowly pulling and maintaining a position on an expanded therapy band creates resistance, providing proprioceptive input that kids need. 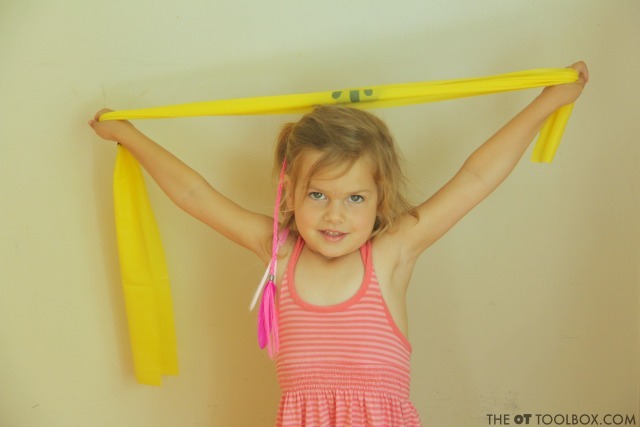 Why use a Therapy Band Exercise Programs with Kids? There are a few things that a great therapy band exercise program has when it comes to strengthening programs or exercises for kids. 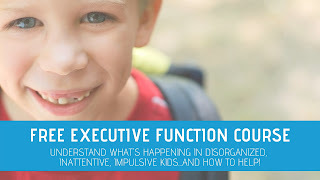 FUN- A therapy exercise program for kids must be more than a simple handout copy of exercises. 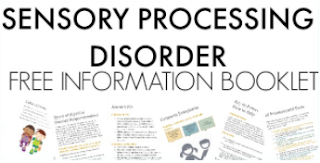 That exercise sheet is sure to land on the top of your therapy clients refrigerator. 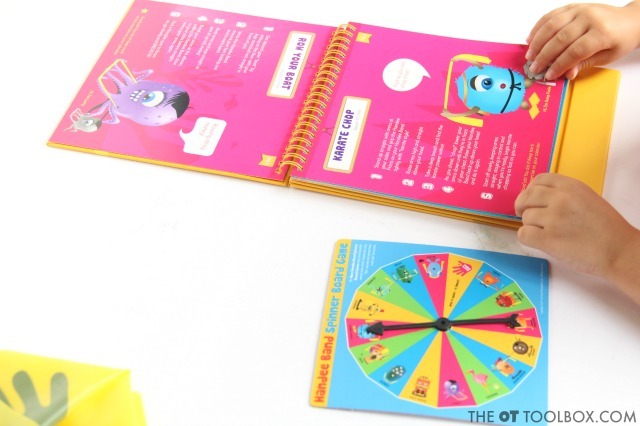 A therapy program that has bright colors, fun characters, games, and interactive components is a win! Creative- A therapy exercise program that uses animals, monsters, creatures, and fun characters is one way to get kids moving and coming back to try out those exercises again and again. Easy- A home program that kids can (and want) to do themselves is one way to ensure carryover. 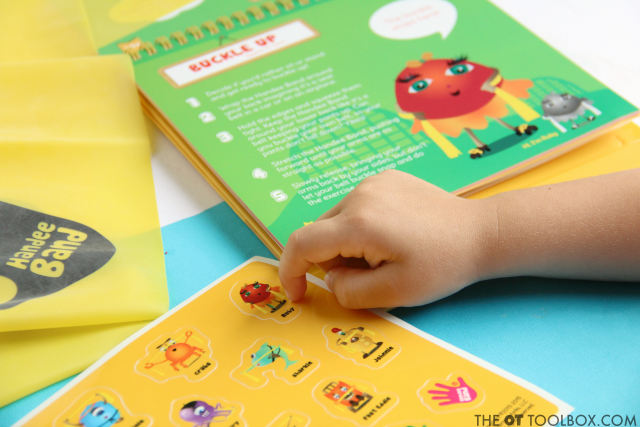 Engaging- A bright and colorful exercise program with fun fonts, hands-on flip cards, and creative characters who get in on the exercise action are all part of a exercise plan geared to create healthy habits. 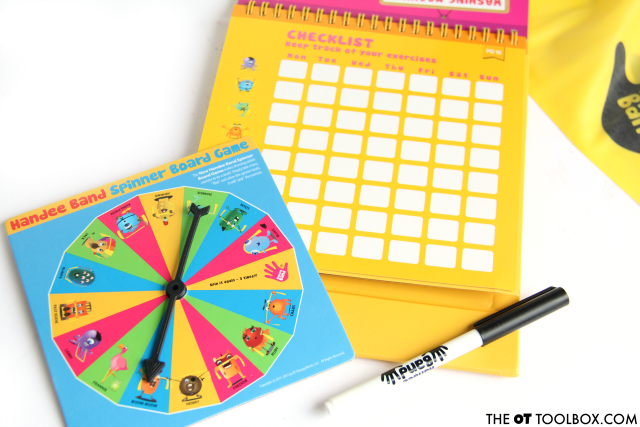 Motivating- Checklists that kids can mark, erase, and rewrite, fun stickers, and a game make therapy band exercise programs fun and not boring...a plan that kids want to do! 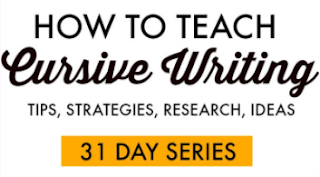 When Francesca Avelli, MS, OTR/L approached me about a therapy exercise program that she created, I was excited learn more. Handee Band is a therapist-created collection of fitness exercises for boosting core strength and upper body strength...and it meets all of the requirements listed above! 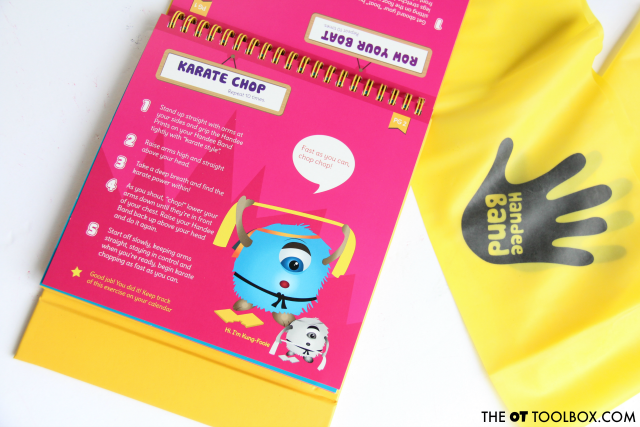 We tried out the Handee Band Exercise Kit and the Handee Band Exercise Cards, and had an absolute BLAST. All while exercising! This exercise kit is definitely a product created by an occupational therapist. As my daughter was trying out the spinner board game and looking through the flip book for matching characters, that thought was on my mind. All of the underlying skill areas that go into using this kit and playing the game are such a boost for kids. Wen playing the game, kids spin a spinner board and need to match up characters to the exercise kit or flip cards. The visual scanning, form constancy, visual tracking, visual discrimination, visual memory, and visual closure was really being used for this game. Then, my four year old flipped through the cards, strengthening her finger isolation and other fine motor skills until she found the matching character. Once she did the exercise, she used more fine motor skills to peel off a sticker...but it had to be the matching sticker, resulting in more visual perceptual skills! THEN, I asked my daughter to mark off the exercise on our checklist, using more fine motor work while boosting pencil control skills and pre-writing strokes as she formed a vertical line in the given box, but not over the lines! But, all of this doesn't even tough on the real strengthening we did with the Handee Band. 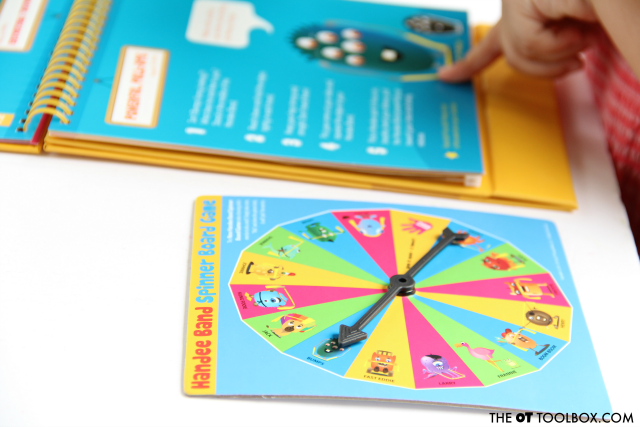 There are so many exercises in the Handee Band kit and exercise cards. There are 15 to be exact, and they each have a corresponding character showing how to do the therapy band exercise. These handheld cards are perfect for the therapist that needs to tote supplies from building to building! We left the Handee Band kit cards and band out on a table for a few days and there were countless times I saw my kids stopping over to do an exercise or two. The Handee Band program is just too irresistible! 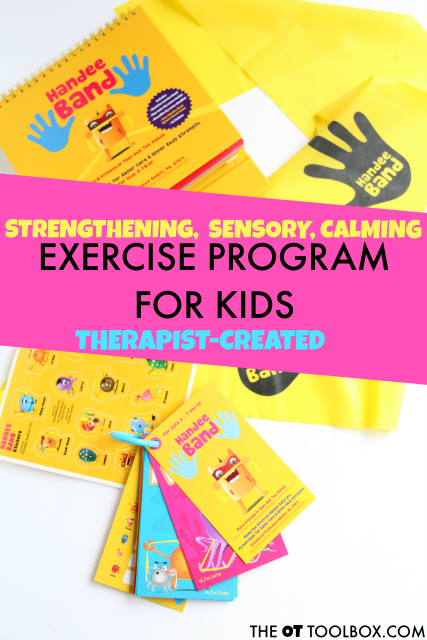 If you are a therapist in a clinic looking for a therapy band exercise program that kids WANT to do, then the Handee Band is for you. If you are a school-based therapist looking for strengthening exercises or proprioceptive input that calms, alerts, and adds to a sensory diet, then the Handee Band is for you. 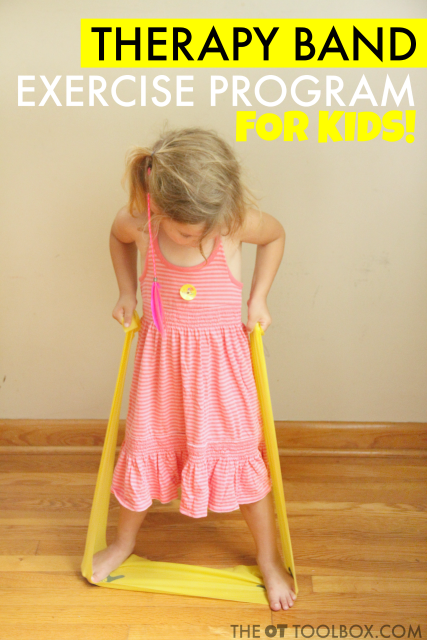 If you are a home therapists, working with kids (or adults!) in the home and need exercises that can tuck into a tote bag, then the Handee Band is for you. 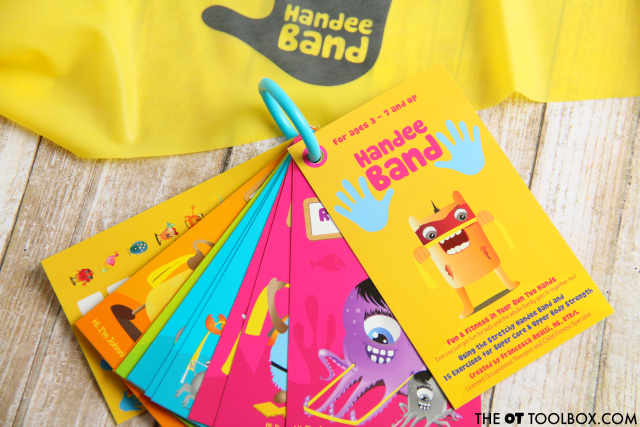 If you are a parent looking for creative and motivating ways to get the kids moving and focused on fitness, then the Handee Band is for you. Grab the Handee Band Exercise Kit here. Check out the Handee Band website for more information. Disclosure: We received a Handee Band exercise kit and exercise cards, but all opinions are our own.